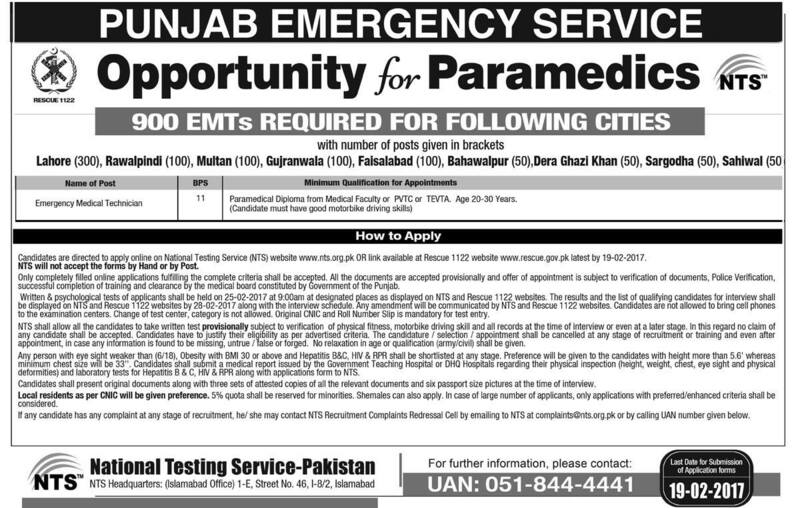 Applications are invited from suitable candidates for vacancies in Punjab Emergency Service (Rescue 1122) functional in all 36 Districts and 15 Tehsils of Punjab. The National Testing Service has been assigned to conduct tests for recruitment against following positions. 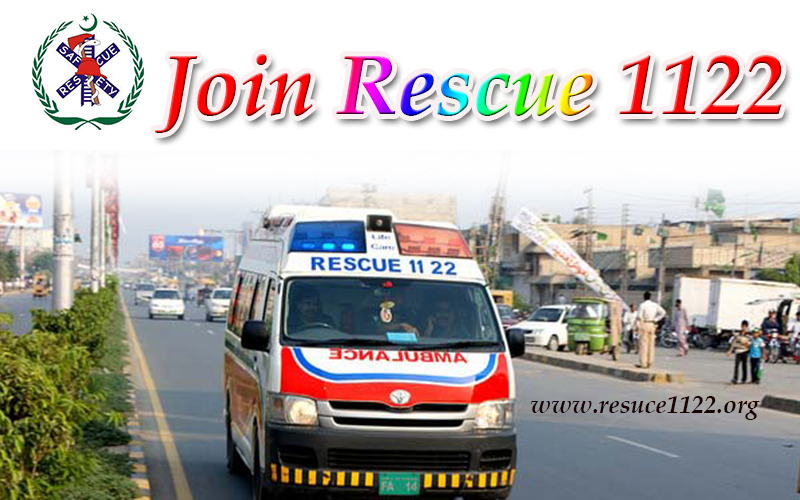 Every one want to join Rescue 1122 for the best salary job and the first reason is due to helping poor and helpless peoples. 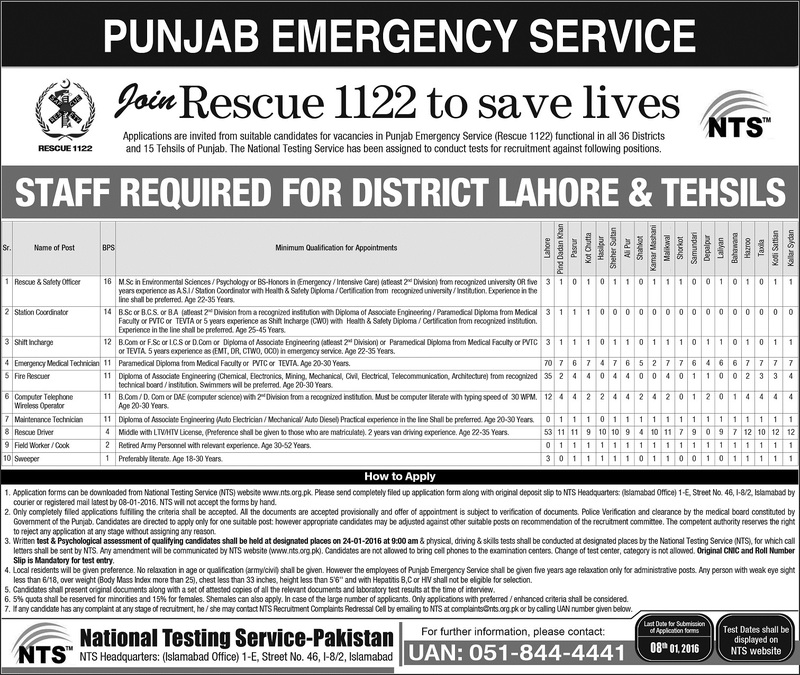 Here are latst jobs of Rescue & Safety Officer, Station Coordinator, Shift Incharge, Emergency Medical Technician, Fire Rescuer, Computer Telephone, Wireless Operator, Maintenance Technician, Rescue Driver, Field Worker/Cook and Sweeper in All tehsils and district Lahore Punjabs. The jobs criteria , latest date to apply, Nts results, NTS answer keys, physical test and Interview dates can be available on NTS offical website. line shall be preferred. Age 22-35 Years. Faculty or PVTC or TEVTA or 5 years experience as Shift Incharge (CWO) with Health & Safety Diploma / Certification from recognized institution. Experience in the line shall be preferred. Age 25-45 Years. or TEVTA. 5 years experience as (EMT, DR, CTWO, OCO) in emergency service. Age 22-35 Years. 4 Emergency Medical Technician 11 Paramedical Diploma from Medical Faculty or PVTC or TEVTA. Age 20-30 Years. technical board / institution. Swimmers will be preferred. Age 20-30 Years. 6 Computer Telephone 11 B.Com / D. Com or DAE (computer science) with 2nd Division from a recognized institution. Must be computer literate with typing speed of 30 WPM. Wireless Operator Age 20-30 Years. 7 Maintenance Technician 11 Diploma of Associate Engineering (Auto Electrician / Mechanical/ Auto Diesel) Practical experience in the line Shall be preferred. Age 20-30 Years. 8 Rescue Driver 4 Middle with LTV/HTV License, (Preference shall be given to those who are matriculate). 2 years van driving experience. Age 22-35 Years. 9 Field Worker/Cook 2 Retired Army Personnel with relevant experience. Age 30-52 Years. 10 Sweeper 1 Preferably literate. Age 18-30 Years. 1. 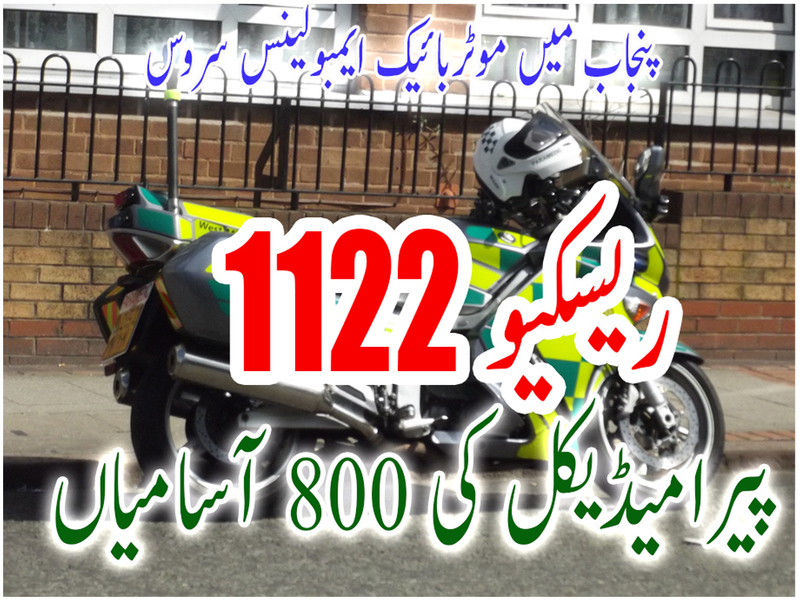 All the correspondence regarding Test will be made through NTS & Punjab Emergency Service Rescue 1122′ websites, candidates must remain in touch with the respective websites. 2. Candidates who have applied for Rescue Driver Post must get their Driving License from National Highway and Motor Way Police Driving Licensing Authority before Written Test . 3. Candidates who already have valid License issued by National Highway and Motor Way Police Driving Licensing Authority, need not to apply again for the same. 4. Physical Test Queries Shall be Entertained on The Spot , No Queries / Complains shall be entertained at later stage. courier or registered mail latest by 08-01 -2016. NTS v/ill not accept the forms by hand. to reject any application at any stage without assigning any reason. less than 6/18, over weight (Body Mass Index more than 25), chest less than 33 inches, height less than 5’6″ and with Hepatitis B,C or HIV shall not be eligible for selection. 5. Candidates shall present original documents along with a set of attested copies of all the relevant documents and laboratory test results at the time of interview. 6. 5% quota shall be reserved for minorities and 15% for females. Shemales can also apply. In case of the large number of applicants. Only applications with preferred / enhanced critena shall be considered. 7. If any cand date has any complaint at any stage of recruitment, he / she may contact NTS Recruitment Complaints Redressal Cel by emailing to NTS at complaints@nts.org.pk or by calling UAN number given below.